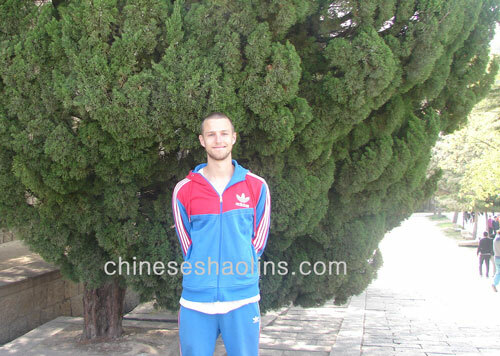 I choose to study Kung Fu in China as I have always been interested in Chinese culture and felt that I would get the best learning environment to study KungFu in China. The martial arts training in kunyu mountain academy really pushed me hard and made me feel mentally stronger than I ever have before. By having my limits pushed it has proven to me that I can do anything I set my mind to as long as I have the will power to keep at it and be determined. As a result my fitness and flexibility have vastly improved as well as my confidence. I also really enjoyed the Taoism class and felt it was a brilliant insight into Chinese culture. My biggest influence at the academy was master Guo, he was a very good teacher and eager to help you get the most out of your KungFu training. He pushed hard but as long as you did your best he would always be there to motivate you and help improve yourself. Also an important influence for me was coach Ariel who helped me out a lot at the academy at times when I was struggling. The training at the academy was brilliant, it was a good balance between fitness and Kungfu . The daily routine was balanced well and kept you healthy and motivated, but it also made you feel as if each day you had achieved something and made progress. All of the masters were very friendly and really good at what they do. All of the other students at the academy are also very friendly and eager to help you with your training. The translators helped me a lot as well with my learning experience but also with helping me learn some mandarin and with my questions I may have had. The area where the academy is located is absolutely stunning with beautiful landscope’s and awesome scenery. The local town of Muping is really cool and a good place to spend time in on the weekend. Overall my experience at the academy was awesome.